Usually this web portal publishes reviews of books, that distinguish themselves from other writings by their unique content. Originality is a great thing. In this case it is different. For the book of Pen is special due to its intentions. Firstly, it is written in Dutch, which for many interesting books is not possible, because of the rather small market. Fortunately the Aula series shows, that it can be done in the Dutch language. Secondly, Macro-economie is understandable for Jack Everybody, regardless of his education. It is a popular edition in the true meaning of the word. Besides, Pen has succeeded in providing for clear and simple explanations, without making a compromise with respect to equality. He pencils with a natural bend, like a true penman. This makes the book worth reading for everybody, including graduated economists3. It is voluminous, nearly 400 pages, amply sufficient for a general text. Pen is (or was, he died in 2010) a popular teacher, but by no means a rebellious thinker. He addresses especially the three common economic paradigms, namely the neoclassical theory (which he calls classical), the keynesian theory, and the monetary theory. But anything that might by classified as heterodox is omitted. Pen has become famous in the heydays of the Keynesianism, and that shows up. His description of the monetarism, which found acceptance in the seventies, is critical and rather icy. The author portrays Milton Friedman as the Jack Frost of economics. This makes the book somewhat radical in our times, where the Keynesianism has lost its appeal. Once Pen wrote that he is "a supporter of Den Uyl, even though I would not call him a blessing for mankind"4. This statement is probably the best proof of the political preference of Pen. De Uyl was also a convinced Keynesian, perhaps more than Pen himself. Macro-economie is a book with lots of text. Yet Pen does not avoid formulas, in those cases that they are beneficial. For instance he uses them to explain the theory of Keynes, or the neoclassical production function, or the growth model of Solow. Figures are also scarce; your reviewer counts approximately ten of them. Pen excels most in those chapters, where he explains the theory of Keynes. The interpretation of its principles, and the modelling of foreign trade and of the national budget is crystal-clear, inclusive of the phenomenon of the multiplier. One even finds expressions like functional finance, and the Havelmoo effect, which are missing in other introductory texts. Pen clarifies how the government aims to balance the national economy, but not the budget. Of course Pen believes that the quantity of money exerts a noticeable influence on the real economy. Incidentally the chapter about the monetary theory is written in a much less stirring style than the foregoing parts. In this chapter the author shows his sharp pen. In addition the book contains useful chapters about the price level and the wage level. In my edition from the seventies the author is clearly shocked and disabled by the then occurrence of stagflation. In the last chapters Pen pays much attention to the economic growth, which is no surprise in view of his Keynesian strain. For that matter, during the early years of Pen the economic growth was self-evident. Pen interprets growth mainly in terms of the Harrod-Domar model. Both are bright economists, but in most modern text-books their names have disappeared. It is striking, that Pen is troubled by the rising unemployment in the seventies. He rejects the social exculsion of the little man, and demands that politics takes care of the pence. He can not believe that Keynesianism is penny wise and pound foolish. Perhaps the prosperity in the preceding period explains why a separate chapter on business cycles is absent5. 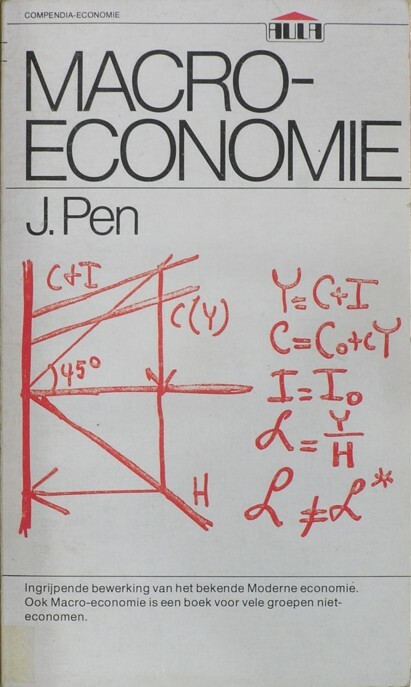 The book ends with an excellent story about econometrics and the models, that are used by the Dutch planning agencies. Such models can explain, quantify, and predict, for instance in aid of economic planning. Finally a chapter is devoted to the political economy and politics. It is striking to read on p.368 that Pen is already worried about "the instability of the international monetary system" and "the enormous capital flows that started to roam over the international capital markt, searching for a stable country". On the other hand, the really big problems would emerge later, in the nineties. Macro-economie is simply a cristal-clear book by a socially engaged author. But as said, Pen is not a radical, and sometimes he lapses into love of ease. Then he becomes a jack-o'-lantern. Especially he denies the existence of conceptual mistakes in the neoclassical theory. On p.277 he argues: "But now we must defend the [neo-]classical theory. ... And in the third place the [neo-]classical theory is a nice object of analysis for students and other studious persons, thanks to its impressive formulas. It is a part of the economy, that provides trust in the ingeniosity of the experts, and that is worth something". This is an argument by Jack-in-office. If this would be true, then the Gazet Sam de Wolff would never have appeared6. However, let us not lament, and forgive Pen.